A Jamaican sprint superstar, one of the world's top high jumpers and the second fastest woman in history will headline the highest-quality indoor meeting ever held on these shores in Athlone's International Grand Prix tonight. 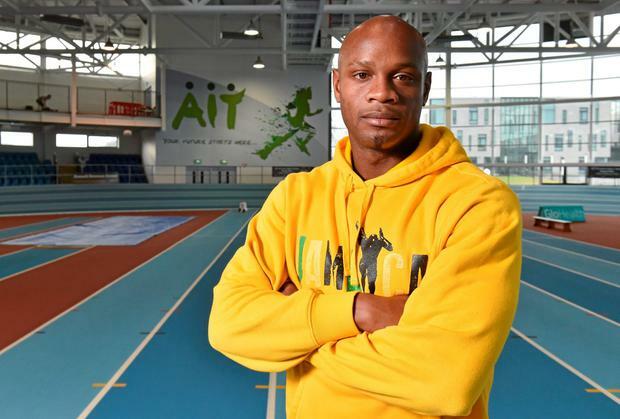 Athlone IT's second major international is already a 1,400 sell-out, with fans expected to line the back straight just to catch a glimpse of Asafa Powell, Qatari high jump sensation Mutaz Essa Barshim and American sprinter Carmelita Jeter. Powell (32) is a former world record holder and three-time Olympic 100m finalist, and while his reputation may have been somewhat tarnished by taking a contaminated supplement in 2013 - it was later ruled that he took it unwittingly - he is still one of the fastest men in history and a massive draw. Powell has set nearly a dozen world sprint records, has PBs of 9.72 and 19.90 in the 100m and 200m respectively, and a 60m PB of 6.50 and he has already run 6.52 this season. Jeter (35) won 100m silver, 200m bronze and 4x100m in London 2012. She famously ran 10.64 in 2009, a time that only the late Florence Griffith-Joyner has ever beaten, but this is her first race of the season. Both sprint stars are expected to set stadium records on Athlone's fast blue track but, for once, what is going on in the infield might outshine them. Barshim (23), the explosive reigning World Indoor high jump champion and 2012 Olympic bronze medallist, won the Diamond League last year in one of men's high jump's greatest ever seasons. He and Russia's Bohdan Bondarenko both cleared 2.42, just 3cm off Javier Sotomayor's world record, and he has cleared 2.40m indoors this season. His brother Muamer (a 2.28m man), Dwight Thomas (a world sprint finalist), American Tianna Bartoletta (nee Madison, fourth in last Olympic 100m final), Eric Sowinski (twice USA 800m indoor champion ) and quality 400m men like Manteo Mitchell and Britain's Nigel Levine are also among tonight's world-class field. And the final event of the night , the Deloitte Mile, looks let to end things on a high as European Indoor 3,000m bronze medallist Ciaran O'Lionaird is leading a bid to run the first indoor sub-four minute mile on this island. The Leevale star bounced back from Achilles surgery in late 2013 to make the European 1500m final last summer but endured heartbreak when he was tripped and taken down. He arrived home from his Oregon base on Sunday and will also race in next weekend's GloHealth Irish Indoor Championships in Athlone. Like many of the Irish athletes tonight O'Lionaird is looking for qualifying for next month's European Indoors in Prague; tonight's time will decide what he event he will target at Nationals. His American training partner Ben Blankenship (a 3.53 miler), Denmark's Andreas Bueno (3.38 1500m) and Ireland's John Travers, Eoin Everard and Danny Mooney are among the mile field, who will be paced through 800m in 1:55. O'Lionaird is a 3.52.10 miler indoors and ran that leg of the distance medley in New York recently but a week later dropped out of a mile in Boston but he said yesterday that was travel-related fatigue and he's ready to go. "I had said two years ago that I wanted to go to Nenagh and try and run sub-four because it hadn't been done here before but there wasn't any money for me to come back," he said. "Now there's this great track and meeting here and the resources to bring us in so there's no excuse for me not to be racing at home which I love to do."